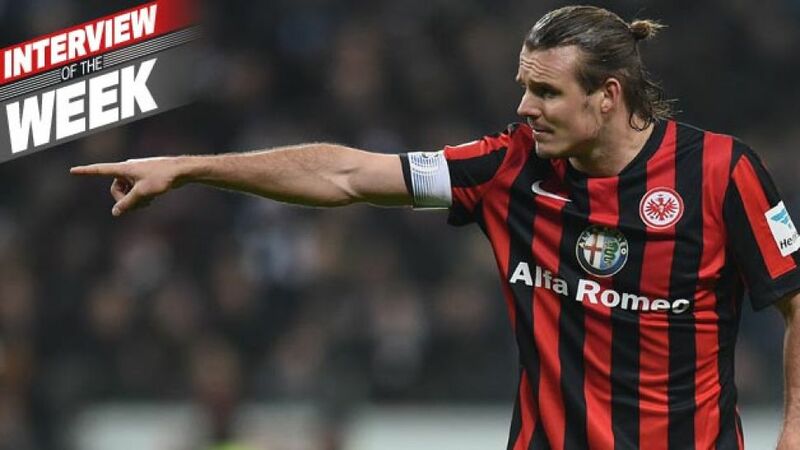 Frankfurt - That Eintracht Frankfurt are on course for European qualification this season is largely down to the clinical finishing of one man: Bundesliga leading scorer . Alexander Meier: No, I’ve said many times that Arjen Robben will win be top scorer. It’s not an issue for me. Meier: For me the important things are to play well and to stay healthy. Being successful as a team is what counts, it doesn’t matter who scores the goals. bundesliga.com: Betting companies are offering great odds on you finishing Bundesliga top scorer though. Are they lacking good judgement? Meier:[Laughs] I couldn’t say, I haven’t checked the odds myself. Betting isn’t something that interests me. bundesliga.com: Does finishing as top scorer appeal to you? Meier: It’s honestly not something I think about. I always just focus on the next game. I always give 100 per cent in every match as well as every training session. Everything else is out of my hands. Meier: That might be true but I think Hölzenbein’s record will last forever. I can’t match that. Meier: That’s a great honour but I really don’t think I’ll be able to score 26 goals. bundesliga.com: Why is it that you’ve been scoring so frequently this season? Meier: That’s all down to my team-mates. As an attacker I depend on them a great deal and they’ve made it very easy for me to score goals. I always play my own game, nothing’s changed. I always just give it everything I’ve got over 90 minutes.bundesliga.com: Under Thomas Schaaf you’ve been playing as an out-and-out striker. Does that make scoring easier? Meier: That’s true. In the past I used to play a deeper role but now I’m closer to the goal. bundesliga.com: Do you prefer your new position? Meier: My preferred position is wherever the coach puts me [laughs]. It always depends on the system we play as to whether I play at the top or further back. I can play in different systems: with two up front or as a lone striker. Both suit me fine. bundesliga.com: Do you set yourself minimum goalscoring targets? Meier: No, I never do that. After all, you can never predict what kind of season you’ll have as a team and as an individual. bundesliga.com: Is that how you prepare for each game, by reducing distractions to a minimum and only focusing on the essentials? Meier: That’s absolutely right. I want to win each game and that’s all that interests me. I don’t care whether or not I score, the main thing is that we win. Meier: That may be true but it doesn’t affect me directly. During a game opponents behave as they’ve always done. I haven’t noticed any difference. bundesliga.com: Do you view your height as an advantage? Meier: It has its advantages and disadvantages. It might help me when it comes to heading, but heading’s not actually my main strength [laughs]. And when a smaller player does a shimmy then it’s more difficult for me. bundesliga.com: What would you say are your biggest strengths out on the pitch? Meier: I let other people judge my game. I find it hard to evaluate how I play. Meier: I don’t know if I’m modest but I’ve always been true to myself. I’m just a normal lad, or rather a man, now that I’m 32 [laughs]. bundesliga.com: Do you feel the physical strain more nowadays than you used to? Meier: I have days where I feel like I’m 27 and others where I feel 39, but that’s been the case since I was 23. Physically I feel in good shape. bundesliga.com: So you want to continue playing for a lot longer? Meier: Definitely. I want to play for as long as my body allows me to play. Meier: I won’t move to another club within Germany or Europe. I feel at home here and I think I’ll finish my career in Frankfurt one day. Maybe an adventure abroad could interest me later on, though. bundesliga.com: Who were your footballing idols when you were younger? Meier: During my childhood Ronaldo was always my idol. I also liked Ronaldinho and Zinedine Zidane a lot. Meier: Lionel Messi. The things he can do on the pitch are unbelieveable. bundesliga.com: Things are going well for both you and Frankfurt at the moment. What makes Frankfurt so strong this season? Meier: We’re a very close-knit bunch and we play well at home especially, better than we do away. Things are easier for us with our fans behind us. bundesliga.com: Why is it that Frankfurt have only won twice away all season? Meier: Unfortunately I don’t have an explanation for that. I don’t think anyone does, otherwise we’d have sorted it out long ago. We’ve struggled more than usual all season. Maybe we’re a bit more aggressive at home, and perhaps that helps our attacking approach to the game. bundesliga.com: To what extent has Schaaf changed Frankfurt’s playing style? Meier: Every new coach makes changes and Schaaf had to do considerable rebuilding after three or four key players left us in the summer. You need to find your feet again under a new coaching team and I think we’ve done that pretty well. bundesliga.com: Did you expect things to go so smoothly? Meier: We’re in a good position but you shouldn’t forget that we’ve also had difficult periods. That’s normal, as every side has up and downs. We can definitely be happy with our season so far. bundesliga.com: Is it true that you'd be satisfied with a draw against Stuttgart on Saturday? Meier: Absolutely. We’ve done so badly on the road recently that earning a point would be a step forward. bundesliga.com: Would it also be a step towards qualifying for the UEFA Europa League? Meier: First of all we need to ensure that we stay up before we start speaking about other objectives. That was our aim at the start of the season and that hasn’t changed. Once we reach 40 points then we’ll definitely have enough to stay up. Then we can start aiming higher. Frankfurt are away to Stuttgart on Saturday afternoon. Click here to find your local broadcaster for the match.